Ruf Maschinenbau GmbH & Co. KG is at LIGNA 2017 in Hannover to unveil new briquetting presses. At the heart of its presentation is the Ruf Briklet, a new briquetting system that supports the automatic transportation of briquettes manufactured using a hydraulic stamp press. The newly developed Ruf Briklet press produces briquettes with a 30 millimeter diameter and thus in a size that can be easily transported on automated conveyor systems. This press is also able to compensate for different particle sizes automatically, so that other materials besides wood can also be processed. The Ruf Briklet is equipped with motors in energy efficiency class IE3. When processing wood shavings, it achieves throughput of around 300 kilograms an hour, with a briquette density of ≥ 1. A central silo distributes the shavings to two double-sided press elements, which means that briquettes are molded at a total of four outlets. 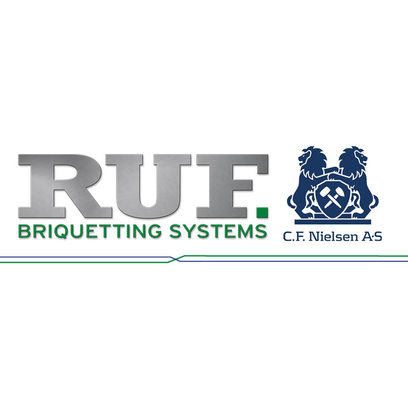 Besides the Ruf Briklet, Ruf Maschinenbau - based in Tussenhausen, Germany - is also at LIGNA 2017 to showcase the LIGNUM range of briquetting systems, which are specially designed for wood processing and have also been further optimized by the company's design team. The perfectly adapted hydraulics, for example, increase efficiency by around 25 percent, enabling users to achieve higher throughput with lower energy consumption.